Above: The sun rises on Waterloo Creek just outside of Dorchester. 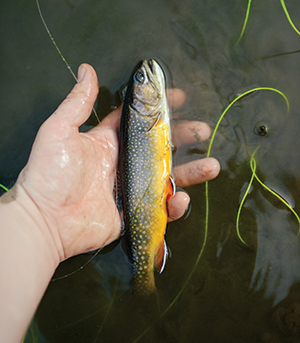 A fly fisherman shows off a brook trout caught on South Pine Creek. Decades of conservation and restoration efforts have sparked a comeback for the three species of trout in Iowa waterways, including the brook, the only one native to Iowa. It has been said many times, repeated many times, and it’s true: Trout live in beautiful places. I was fortunate to grow up in a family that spent most weekends outdoors, fishing in ponds and lakes with spinning gear. We camped at state and county parks, and woke up early to fish for bass, crappie and catfish off a 16-foot aluminum boat. But central Iowa, where I grew up, has vast farm fields and some muddy rivers that don’t bring to mind anything close to a fly fishing paradise. It wasn’t until my early 20s that I discovered the cold, clear spring creeks of northeast Iowa. I’m still a little bitter it took so long. 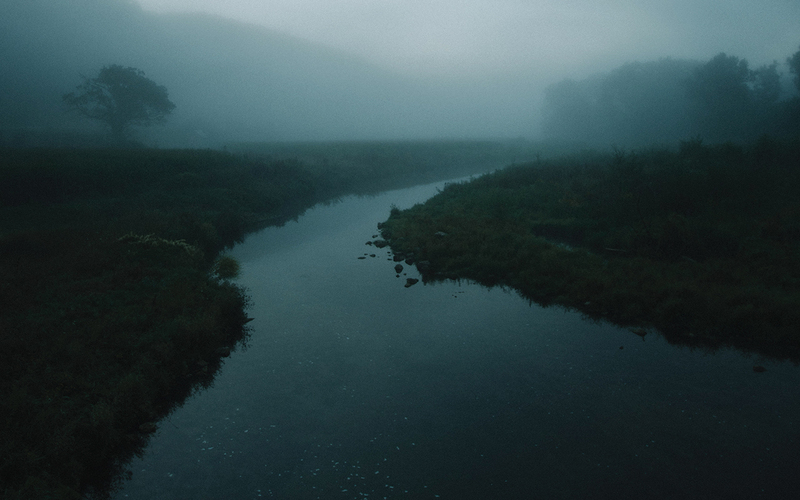 I owe everything about my progression as a fisherman to the trout in the Driftless Area—a pocket of Iowa with big bluffs, rocky limestone outcroppings and small creeks that remain cold year-round. Inside those creeks are colorful fish that dart away at the sight of my shadow and eat insects from clear water that washes over rocks and into runs. 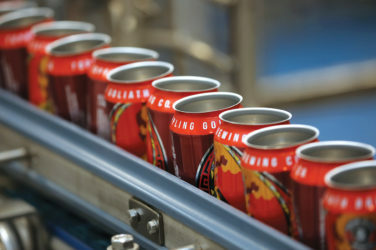 My trips to northeast Iowa became more frequent. Each visit, I explored new streams with names like Bloody Run, Waterloo, Coldwater Creek and Trout River. Most of the time, I was alone with the birds, the trees and the bugs. I taught myself how to cast, assemble a rod, tie flies and master new knots. I learned how to fish all over again. I don’t golf or own an expensive road bike. I fly fish, so I can spend time outdoors, dipping my hands and feet in clear natural water, and for the challenge of catching a big fish on a small fly. I tumble upstream, turning over rocks to find insects, casting to fish I can see or to where I think fish should be. 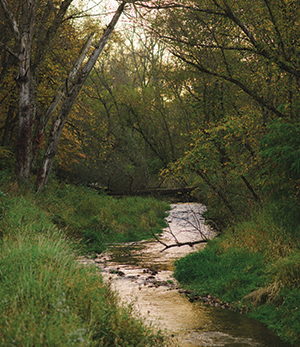 A cold-water stream flows through the timber in the Driftless Area. Trout swim through more than 100 streams in northeast Iowa, sometimes with populations approaching 2,000 fish per mile of water. “Don’t you have to go to the mountains to fly fish?” I hear this all the time, and it always presents an opportunity to talk about the fishery we have here in Iowa. We don’t have mountains and big waterways overflowing with large trout. What we do have are uncrowded, intimate cold-water creeks and streams in a corner of the state, with robust populations of stocked and wild fish. 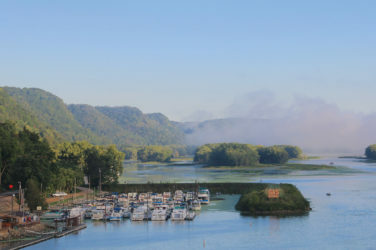 The Driftless Area occupies more than 20,000 square miles of land along the Mississippi River in Iowa and surrounding states. The glaciers that pushed loose rock and gravelly soil, called drift, into the deep valleys across Iowa and the rest of the upper Midwest never reached there, so a rugged terrain of trees and spring-fed creeks that stay cool all year long—a necessity for trout—remained. Settlers arriving in the 1800s began clearing timber from the hillsides and planting crops. This caused soil and sediment to fill the valleys and raise or bury the streambeds, degrading the native trout habitat and depleting the populations. Decades of federal and state streambank and watershed restoration, plus work by conservation groups like Trout Unlimited, and robust stocking efforts—native brook trout, plus rainbow trout from the American West and brown trout from Europe—sparked a comeback for these waters. In the early 1980s, only four or five streams supported natural trout spawning. Today there are 80, according to Michael Steuck, regional fisheries supervisor with the Iowa Department of Natural Resources. Some of the most productive of Iowa’s 100-plus cold-water streams have trout populations now approaching 2,000 fish per mile of water—hard to believe just by looking at these slips of shallow water, many of which are only 10-15 feet across. Like in other Driftless streams, the spring-fed water in South Bear Creek rarely freezes, meaning fishing for trout continues even in winter. And it’s big business. According to an Iowa DNR study, trout fishing in Iowa added $22.8 million to local economies in 2016, most in the small towns and communities around Driftless streams. Fishing at one trout stream near Manchester in Delaware County (population about 5,000) contributed about $1.35 million to the local economy that year. This past May, I hosted a group of new fly fishers at Prairie Song Farm on Waterloo Creek, just outside the town of Dorchester in Allamakee County. The house on the property is nestled in the valley about a hundred yards from the stream. 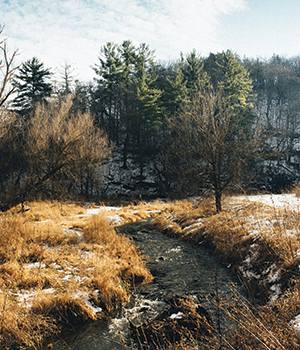 Row crops covered the land until about 15 years ago, when restoration efforts began to transform this slice of the valley back to native prairie and create a habitat for trout. Two smaller streams feed Waterloo Creek on the property. One, revived from a small spring that trickles just off a gravel lane, was once choked off by crops and weeds but now provides good spawning water. For the last year this has been my first choice to bring people new to Driftless fly fishing, to show them what this part of the state looked like before it was settled. By the end of a trip they understand places like this are worth protecting. I can’t remember having a better weekend of fishing in Iowa. When we arrived, the prairie grasses were up along the banks. The water had only a touch of color to it, close to clear. You can’t see the cold water flowing out of the limestone outcroppings upstream, but you can feel it every time you release a fish. We fished mostly small puffy flies with ant and beetle patterns. Behind the flies we attached tiny emergers. We tossed them across the stream to the opposite bank, and one after another, the fish rose to ambush the flies before diving back underwater. Once they realized they were hooked, the trout jumped, ran, or just held in the current, depending on their size. Our group caught dozens of brown trout in the 10- to 12-inch range, with a few up to 16 inches, large for this area. 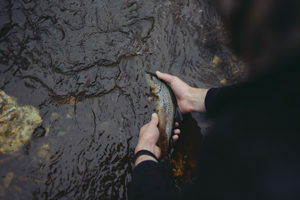 A fly fisher releases a healthy brown trout back into an Iowa stream. Brown trout were imported to America from Europe in the late 19th century and now establish their own natural populations in suitable streams. Whenever I travel outside the state to fish, I catch myself talking to my guide or fishing partner about Iowa waters. How the state is home to one of the largest collections of limestone spring creeks in the world, full of beautiful trout. How every stream has its own personality. How once a season I’m able to catch a 20-inch brown trout in a foot of water. How on a Tuesday in spring I might have miles of stream all to myself, with just a short drive to the next one. 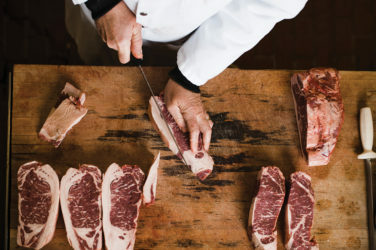 Each time I am excited to make the trip to the Driftless from Des Moines. A few hours in, the topography starts to change. I start to change. When I’m on the water, I feel like a little kid with a magic wand that can make trout appear. I hold in my hand something wild for a moment before letting it go. It never gets old. There is mystery in something you can never master.